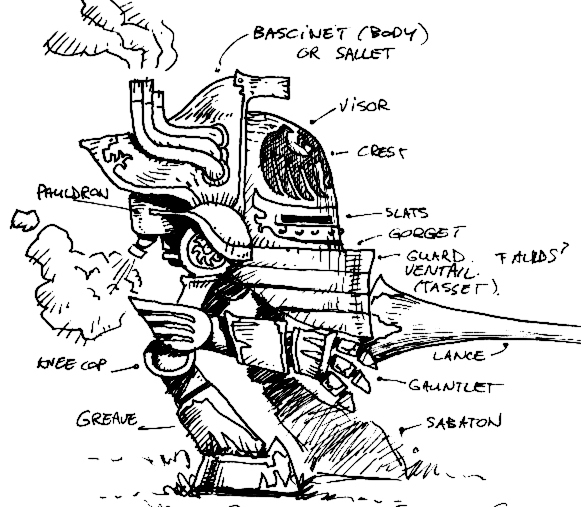 A Royal Adyron steam mech designed by the Conray Brother Studio. It is a lighter-weight line, with heavy forward visor and tasset guard to make up for the lighter hull. The cockpit is smaller than in the more spacious Hildebrand mechs, but with controls laid out in the characteristically intuitive Conray manner. It can be comfortable to run at top performance for hours, thanks to eight heat vents and four air intakes with pumps. The pumps, designed by elite machinists from the engineering guild, are compact, but frequently break down in battle. The hull was forged in The Crucible, the hottest and oldest blast furnace of Adyron. The Conrays guarantee the construction of each custom mech is presided over, and blessed, by engineer-druids. 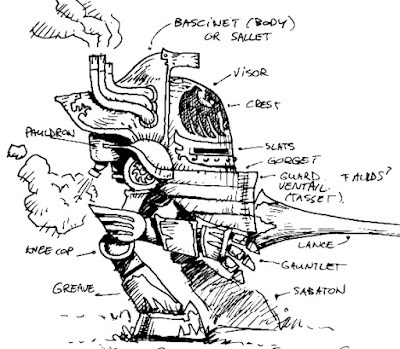 The Royal was used as a scouting steam mech by the army of King Haress, and was popular with barons and dukes of Westin until the Hildebrands introduced the Dragoon.